You know what it’s like when you’ve returned from a trip abroad - you enjoyed the local food and hooch in bustling little hole-in-the-walls, wandered off the beaten path and in all, had a superbly authentic experience living like local. None of those tourist clichés for you! Now you’re back and you want to share your tales and experiences with the folks at home. Well, back in the 1850s, a Scottish-born politician, diplomat and occasional travel writer called David Urquhart did exactly that after a spell in Constantinople. He became almost evangelistic in his championing of Turkish Baths upon his return home, having enjoyed the health benefits of the hammam after his travels in Spain, Morocco and Turkey. The first example of the Victorian Turkish Bath was built in Ireland, and within a decade had ignited the flames of a bona fide fad in Victorian Britain, with around 600 operating in their heyday at the turn of the century. Latterly, the public’s fascination diminished, and these days very few remain across the UK. Here in Edinburgh, we have the last remaining publicly open ‘hot-air’ Turkish Baths in Scotland; the other is housed in Glasgow’s members-only Western Baths. Located within Portobello Swim Centre, a grande dame of Victorian architecture with its traditional swimming pool, the Turkish Baths themselves are one of Edinburgh's ‘best kept secrets’. 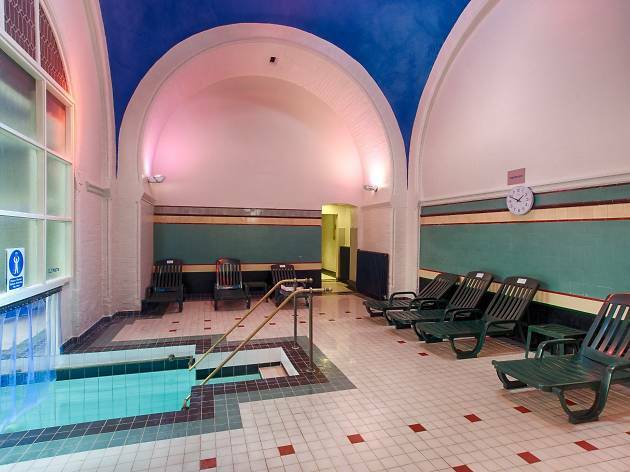 With Moorish-influenced design (albeit somewhat let-down by contemporary plastic furniture) a selection of hydrotherapy rooms await to relax the mind and rejuvenate the weary body. It’s recommended you start with a cool shower before working through the sequence of steam room, followed by three progressively warmer hot chambers (tepidarium, calidarium and laconium) before blasting your circulation with a plunge into that icy cold pool. It's said to be the ultimate relaxation therapy, so whether you've had a hard day at the office or just fancy a treat, head down to Portobello to try it yourself. Turkish Baths, open seven days a week, Portobello Swim Centre, 57 The Promenade, EH15 2BS. Sessions cost £7.20 per person.